ProForm PFEL01415 Cardio HIIT Pro Trainer is the new, revolutionary, commercial grade iFit ready hybrid elliptical/stepper machine that has your feet moving within five-inch horizontal and ten-inch vertical elliptical track. You can find a variety of exercise programs in the library, so you can move from total beginner to more advanced levels. It includes a large 10-inch color capacitive touch display that has all the indicators you need as well as a total of 34 workout apps. The 2-speed coolaire exercise fan will help keep you cool during your workout sessions. It comes with the Bluetooth Smart chest strap for the EKG grip pulse, so you stay in your target heart rate zone to burn more calories and get better overall results. 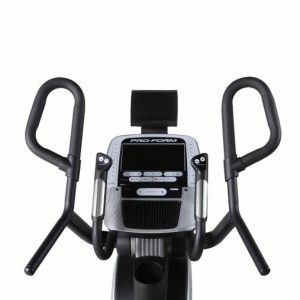 ProForm Cardio HIIT Pro is a very robust and heavy-duty, commercial level product and has a user weight capacity of 350 pounds. There is a built-in tablet holder at the front along with an iPod compatible sound system, so you can keep entertained by videos or songs and go for longer. You have a total of 26 different levels of digitally controlled resistance from very easy to very difficult (SMR- Silent Magnetic Resistance). With the 30 lb. inertia-enhanced flywheel it runs quietly and smoothly at all times. You can see the very large leveling feet on both sides in the photo so you can feel stable while you’re training. Cardio HIIT Pro is a heavy duty product that weighs 225 pounds but includes the front-mounted transportation wheels and is also smaller in size as it measures 39 x 29.25 x 66.7 inches, and relocating and storing it is not a major drama. You will be able to do a great upper body workout and the 10-inch vertical elliptical path will give you the exact same feeling as stepping, along with an elliptical stride. You can put it pretty much anywhere in your office or home. You will be really be feeling the burn, lose calories and fat efficiently and in less amount of time than other fitness machines like regular ellipticals or treadmills if you use it regularly, combined with a healthy eating plan. It offers a very low-impact type of total body workout and will be easy on your joints and knees. HIIT stands for High-Intensity Interval Training- working as hard as you can in a short period of time, by very intense workouts followed by quick rests so you keep your muscles better, burn calories and fat, get and stay fit. Because it is done in a shorter period of time, you can fit it in your busy schedule easily. You will be pushing into your anaerobic zone with the ProForm Cardio HIIT, and feeling the burn at higher levels gradually. You will be working harder and improving your fitness levels, and then you will be working even harder. You will get leaner and stronger in no time. It is able to accommodate different needs of people with different levels of strength. It may not be ideal for you if you’re in the market for a low-intensity workout and not if you’re on a budget as this one costs quite a bit. It is offered with a warranty of two years for the labor, five years for parts and lifetime for the frame.